Some days the enemy can almost convince a person that he's winning. satan gleefully fans the flames of hatred, injustice, violence, lawlessness, confusion and strife and it seems as though he's found plenty of human targets willing to march to his tune. It's disheartening to say the least. Each year at the Christmas service at our son-in-law's church they darken the meeting room completely. Then one lone candle is lit, which then is used to light the next one and then that one lights the next one and on and on until the room is filled with the light of hundreds of candles. 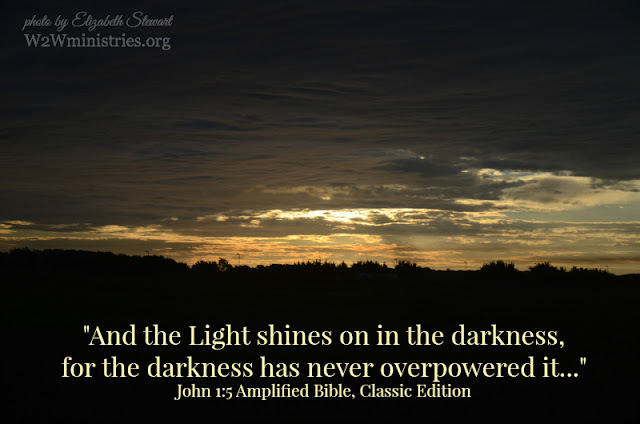 Jesus is the Light that forever and ever shines on in the darkness, that can never and will never be overpowered by it. We, His people, are the other little candles lit by Him, 'til we are wholly filled and flooded with His light in our innermost being and personality. On a missions trip to Ghana, West Africa, my husband and I took a night flight coming home. As the plane gained altitude, I looked down and saw the glow of firelight from hundreds of little villages sprinkled across the landscape. God is still ruling on His throne in heaven. satan and all of his dark demonic forces will never be able to usurp Him. And on this earth, He's got an army, an army of light bearers. As I'm typing this, I picture Him on His heavenly throne looking down upon the darkness of this earth, and in the midst of the darkness billions of lights are shining. I'm one of those lights, and if you have received Him as Savior and Lord, you are one of those lights, too. I picture Him saying, "ARISE! SHINE! My glory is on you and in you!" Maybe we've let the darkness intimidate us too much. Maybe we've believed satan's lies that he's winning the battle. Maybe we're convinced satan really can blow out the light. he's a liar. 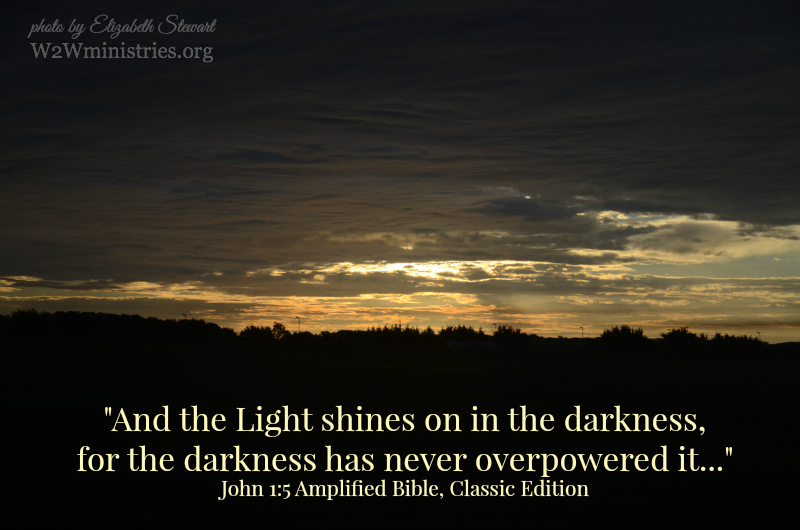 The darkness has never and will never overpower the light. It's up to us to quit cowering and to courageously get out there in the darkness and shine. This beautiful reminder makes me think of the song I learned as a child, "This Little Light of Mine". Yes, in these dark days we can be the light shining forth for all to see God's love & glory here on earth. We need to continue to shine for others that are lost to find their way to Jesus, & for encouragement to our brothers & sisters in Christ. We need to hold on to the truth of His word & know that darkness is not going to prevail despite what we see going on in our world. Shine on, my friends, shine on! It made me think of that song, too. Let it shine till Jesus comes! Beautiful encouragement! Just what we need at the end of a week that looked messy and bleak. God is the light that reigns forever. I will be carrying these words into this coming week and beyond! Lovely encouragement! May we each faithfully shine like stars wherever we are. and that light is love. Your post makes me think of the words of MLKjr. who said " Hate cannot drive out hate; only love can do that. May the light of love continue to shine. Many blessings to you Elizabeth and thanks so much for linking up at #GiveMeGrace.